Maldives is famous for our amazing dive sites, coral gardens, abundant marine life and great visibility underwater. 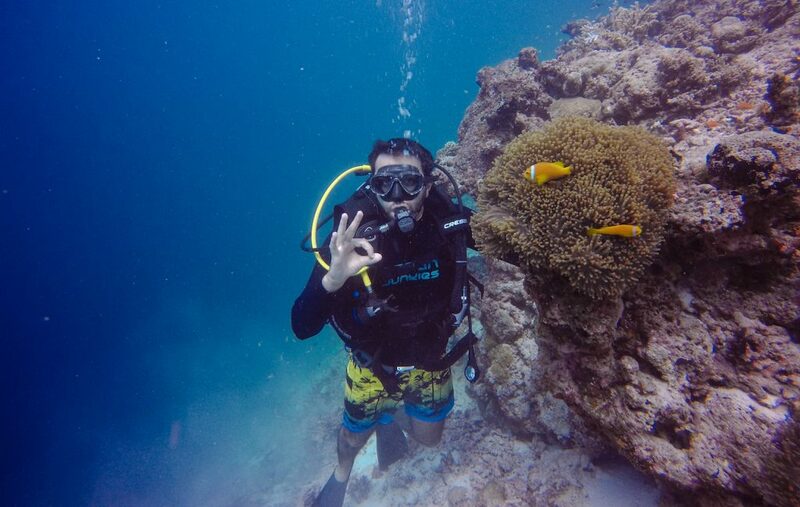 However, even though we grew up surrounded by water, a lot of Maldivians hesitate to plunge into the ocean and scuba dive. It’s such a shame since people travel here from all over the world just to explore the oceans of Maldives. Since most people are afraid of the unknown we are here to debunk the most common myths regarding scuba diving and hopefully this will help you take that step to discover the amazing world below the waves. Myth: You have to be an expert swimmer in order to dive. Reality: You could go on your very first dive with no swimming experience. Your instructor will teach you the skills needed and practice them with you in shallow water before taking you for your first dive. All through the dive your instructor will be holding onto your tank from behind and all you would need to do is follow his instructions – no swimming required. However, in order to get certified as a scuba diver there are certain exercises you need to complete but you can still go on a discover scuba diving session with no prior swimming experience. Reality: If you encounter a shark while diving you should count yourself very lucky! Sharks might be the biggest fear responsible for stopping people from trying out scuba diving but they are actually not scary at all. Most sharks are benign and the ones that have been known to attack, do not live in the waters of Maldives. We have no threats from sharks in our waters but divers should always make sure that you do not tease any animals while in their territory. Reality: Diving carries the same “risks” you would face while walking on land. Chances are if you walk into an active volcano, cross the road without looking both ways or decide to hold your breath for 10 minutes you’ll inevitably end up hurting yourself. Scuba diving should never be attempted without a buddy or without proper training, much like how you shouldn’t attempt to drive a car without learning how to drive. There are back up plans on top of back up plans in order to keep you safe as you dive and you should always make sure you dive with a professional guide who has extensive knowledge on the reef and the currents. If you follow your guide’s instructions scuba diving is the safest recreational sport you could possibly take part in. We hope this helps you to cross scuba diving off your bucket list but don’t blame us if you get addicted! If you have any doubts about diving we would be more than happy to answer them for you.